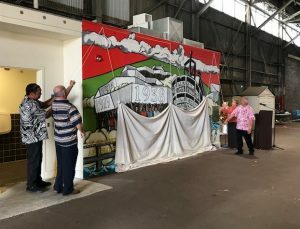 HILO — The Hawaii Department of Transportation (HDOT) Harbors Division unveiled a mural today in the Hilo Harbor cruise passenger terminal commemorating the 80th anniversary of the Hilo Massacre; one of Hawaii’s earliest labor disputes. The unveiling and public presentation was done in conjunction with the annual observance by the International Longshore and Warehouse Union (ILWU) and other unions at Hilo harbor on August 1st. 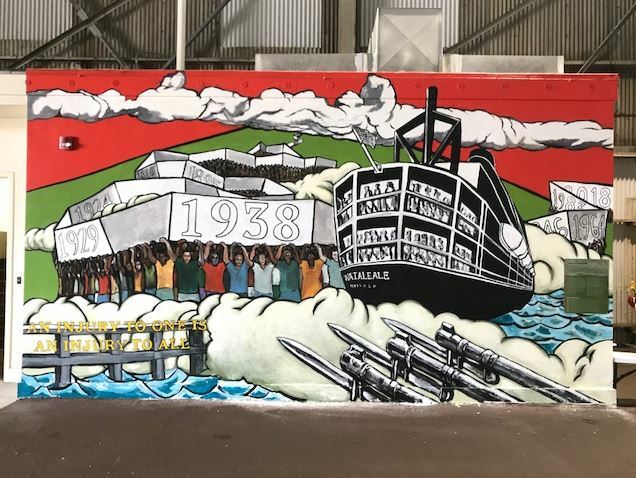 The mural is entitled “Legacy of Solidarity” and is the work of Solomon Enos and Kai Kaulukukui. The art recounts the events of August 1,1938, and connects them to other historic occasions of community unity and cohesion significant to Hilo and Hawaii Island. From left to right: Senator Kai Kahele; Deputy Director for Harbors, Darrell Young; Representative Richard Onishi; Representative Mark Nakashima; International Vice President – Hawaii ILWU, Wesley Furtado; Senator Lorraine Inouye, Mural Artist Kai Kaulukukui, Representative Chris Todd. 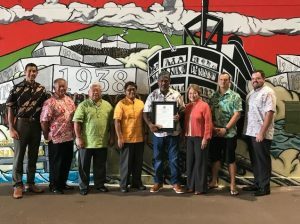 Unveiling of the mural: Harbors District Manager for Hawaii Island, Jeff Hood; Dustin Dawson, International Field Representative – Hawaii ILWU; Senator Lorraine Inouye; Deputy Director for Harbors, Darrell Young.